So far as I know, no one knows how many otherwise-regular convex “bowtie” polyhedra exist — that is, convex polyhedra whose only faces are regular polygons, and pairs of isosceles trapezoids in “bowtie” formation. With the aid of software called Stella 4d, which you can find at http://www.software3d.com/Stella.php, I do believe I’ve found another one which hasn’t been seen before. I then augmented each enneagonal face with regular antiprisms, took the convex hull of the result, and then used Stella’s “try to make faces regular” function — and it worked, making the octagons regular, as well as the enneagons. 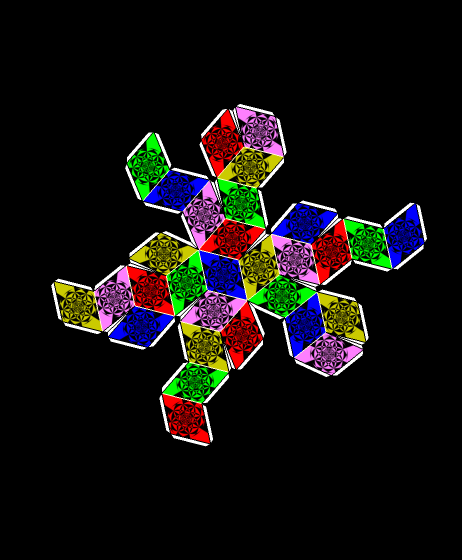 This polyhedron has the twelve regular decagons and twenty regular triangles of the truncated dodecahedron, but they are moved outwards from the center, and rotated slightly, creating gaps. These gaps are then filled with thirty pairs of isosceles trapezoids in “bowtie” formation. That gives this polyhedron 92 faces in all. To create this using Stella 4d (see http://www.software3d.com/stella.php), I started with a truncated icosahedron, augmented each of its faces with a prism that was 1.5 times as tall as the base edge length, and took the convex hull of the result. It may qualify as a near-miss to the Johnson Solids — for that to be the case, all faces would have to be close to regular, but “close to” has no precise definition. I’ll have to consult with the experts on this one! As you can see, the rhombic enneacontahedron has three of these yellow panels meeting at some of its vertices, along with three of the red, narrow rhombi. For this new variant, at the top of this post, the five-rhombi panels are rotated until only two of them (rather than three) meet at certain vertices, and the thirty red, narrow rhombi between the yellow five-rhombi panels are replaced by twenty equilateral (but non-equiangular) hexagons, also shown in red. This rhombic triacontahedron is decorated with the image found in the last post, which I made using Geometer’s Sketchpad and MS-Paint. Projecting it on the faces, colorizing them, and making this rotating .gif were all done using another program, Stella 4d, which can be found here — http://www.software3d.com/stella.php — with a free trial download available.